Golf’s world number one Justin Rose should use his profile to highlight human rights issues and counter the "propaganda value" of this week's Saudi International, according to Amnesty International. The tournament has attracted a star-studded field despite the killing of journalist Jamal Khashoggi last year in the Saudi Arabian consulate in Turkey focusing further attention on the country's repressive regime. Rose has defended his participation by saying: "I'm not a politician, I'm a pro golfer," but Amnesty would like to see the Olympic champion and other high-profile players put their visits to the country to good use. "We haven't called on golfers to pull out of the Royal Greens event and it's not for us to say who should be playing in these tournaments or whether countries like Saudi Arabia should be hosting them," Amnesty International UK's director Kate Allen said. "The point with this, like other sporting events in countries with atrocious human rights records, is to fully understand the context. "Saudi Arabia is currently jailing and torturing dissidents and human rights defenders, is heavily involved in the indiscriminate bombing of hospitals and homes in Yemen, and the spectre of Jamal Khashoggi's gruesome murder hangs over the entire Saudi government. 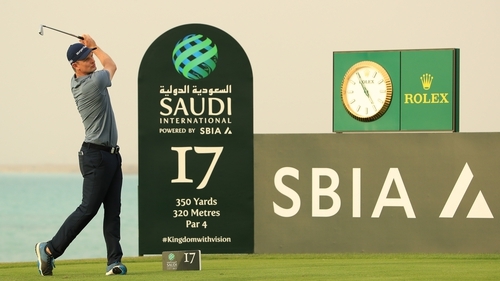 "By hosting the European Tour, Saudi Arabia is almost certainly hoping to use the glamour of elite golf and the lush panorama of the Royal Greens course to subtly rebrand the country. "Countries like Saudi Arabia are well aware of the 'sports-washing' value of international sporting events, and the players need to understand this too. "We'd ask Justin Rose and other players to use their considerable public profiles to raise human rights issues. "If each member of the European Tour tweeted their support for Loujain al-Hathloul and the other jailed women's rights activists in Saudi Arabia, they could go a long way to countering their propaganda value to the Saudi government." Rose comes into the event on the back of his victory in the Farmers Insurance Open at Torrey Pines, his 10th PGA Tour title keeping him top of the world rankings ahead of US Open and US PGA champion Brooks Koepka and Dustin Johnson. "Obviously the world number one position has been going back and forth," Rose, who will play alongside Koepka and Henrik Stenson in the first two rounds, said at his pre-tournament media conference. "Last week I managed to just put a little bit of breathing space in there and that's motivation for me this week to continue that form to try and continue building that lead. "The world number one position is important to me but it's not my primary focus this year. My primary focus this year will be around the major championships, but clearly it's a nice thing to have. The bigger lead you can build, the better."